Burrishoole Abbey, County Mayo, Ireland, 2009. This image was made while leading a photo tour of western Ireland. The headstone was illuminated from the left with a Surefire G2 flashlight, and minimum aperture was chosen to maximize depth of field with the longer focal length. The underexposed background has just enough information to provide context, and the moon rising in the distance provides an additional counterpoint to the foreground subject. Canon 5D, Canon 28-135mm lens at 70mm. 13 seconds, f/32, ISO 100. It’s not that I’m preoccupied with death, but just that I find cemeteries to be interesting places reflective of culture, and most importantly, the residents usually don’t complain about trespassers. Oddly enough, Matt Hill and I first met in a cemetery while photographing the Headless Horseman in 2010! What better place to do some night photography in late October? If you are lucky enough to live in a place with an intriguing graveyard, I recommend that you give it a try––but you might want to take a friend, especially if you are wary of headless horsemen or things that go bump in the night. In the paragraphs that follow, I’ll offer some guidelines and suggestions for night photography in cemeteries. Be sure to pay attention to the image captions, as they contain all of the technical details and explanations of the illustrations. Aside from the creepy factor, there are no particular peculiarities to night photography in a cemetery any more than in our more usual nocturnal haunts. The terrain and lighting can vary from one to the next just as it can in any environment. Making successful images in a graveyard is dependent on finding an interesting subject and combining it with interesting light, whether you find that light or create it yourself. If you are fortunate enough to have a little fog as well, then you really can’t go wrong. These two images were made on the same foggy night in May 2016. The cool-toned image is dominated by backlighting with a Coast HP5R LED flashlight supplemented by moonlight. Nikon D750, Nikon 24-120mm f/4 lens at 24mm. 30 seconds, f/5.6, ISO 800. The warm-toned image is dominated by light from fog-diffused high pressure sodium vapor streetlights, with a key light on the cross from a Coast HP5R flashlight to camera right. Note that the 90-degree sidelighting exaggerates the texture in the cross, creating strong contrast in an otherwise soft scene. Nikon D750, Nikon 24-120mm f/4 lens at 50mm. 10 seconds, f/5.6, ISO 1600. Conditions and opportunities in large urban graveyards might be very different from small rural ones, with the urban options being relatively unaffected by moonlight due to streetlight, while lighting in more remote cemeteries may be totally dependent on the phase of the moon. Just as with any other landscape, graveyards can be photographed in starlight, moonlight, streetlight, with light painting, or any combination of light sources. If you’ve read many of my previous articles, you know that I like to revisit locations over time in different conditions (see “Revisiting Locations Can Lead to Seeing with New Eyes”). 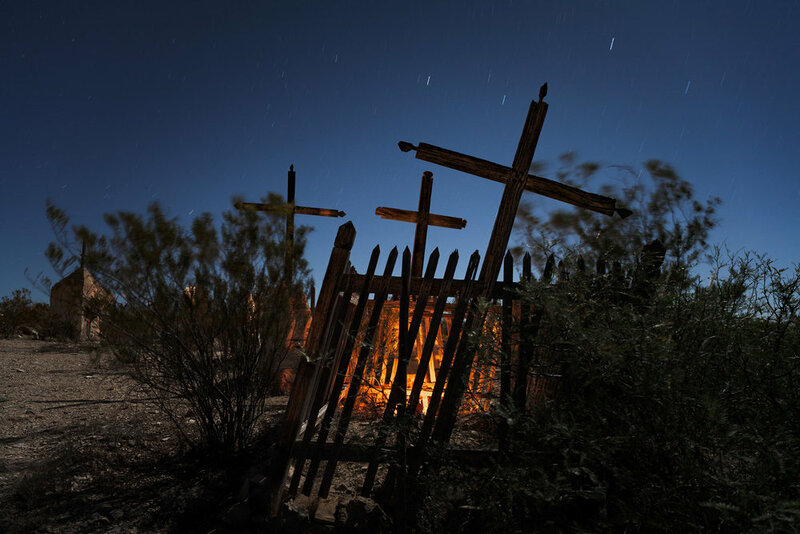 The two images below were made in the ghost town of Terlingua outside Big Bend National Park—the first under a full moon in 2007 and the second nine years later under a new moon. I tried as best as I could to recreate the composition from memory in the later shot, but the conditions were so different that the resulting images look like they were made in different places altogether. I’d be hard-pressed to pick a favorite between the two, as I like them both. They are just different. Of course it’s more difficult to work in starlight, and we’re faced with the usual challenges of bumping up against the limits of our equipment with noise from high ISOs, short exposure times to preserve star points, and shallow depth of field from wide apertures; therefore, compromises will have to be made on a case-by-case basis to get the best results. Foregrounds are more dependent on light painting and will usually be underexposed in the absence of added light. These two images were made nine years apart at the same location. The 2007 image was shot during a full moon at Dia de los Muertos, when candles illuminated many of the grave sites. The orange glow is from one such candle. There was no added light painting. Canon 5D and an adapted Nikon 28mm f/3.5 PC lens. 5 minutes, f/8, ISO 200. The 2016 image was shot on a moonless night with fast-moving clouds in April, with Coast HP5R backlighting from camera left and a brief pop of bounced light in front of the fence with the same light source. Atmospheric conditions and added lighting make these two images of the same subject completely different. Nikon D750, Nikon 24-120mm f/4 lens at 24mm. 30 seconds, f/4.5, ISO 6400. Every boneyard is different, and reflects the spirit(s) of the people buried there. The old cemetery at Terlingua is full of mostly Mexican and Mexican-American miners, many of whom died as a result of breathing the toxic mercury vapors that were part of the smelting process at the nearby cinnabar mine at Villa de la Mina. The humble wooden crosses lean in all different directions, and the place seems abandoned and forgotten except at Dia de los Muertos on November 1, when elaborate decorations festoon the graveyard and many of the graves are adorned with little skulls made of sugar. Jacob Taylor has resided at Sleepy Hollow in Concord, Massachusetts, since 1767. The image was made in 2010 with a Surefire G2 flashlight from slightly above the stone, flagged with black mat board so the camera didn’t see the light. The three headstones in the middleground were lit with the same light source, but indirectly. I bounced the light off of a 12-inch Wescott reflector from behind the central stone. The shallow depth of field and strong vignetting also help to isolate the primary subject. Canon 5D Mark II, Canon 50mm f/1.4 lens. 3 minutes, f/4, 100 ISO. Jacob Taylor is buried in the Sleepy Hollow cemetery in Concord, Massachusetts. Many of the graves there date to the late 17th and 18th centuries, and the elaborately hand-carved tombstones chronicle the evolution of styles and trends in funerary art during the Colonial period of U.S. history. The modern side of a different Sleepy Hollow Cemetery in Tarrytown, New York, dates from the first half of the 20th century and contains large family crypts and mausoleums of wealthy industrialists. 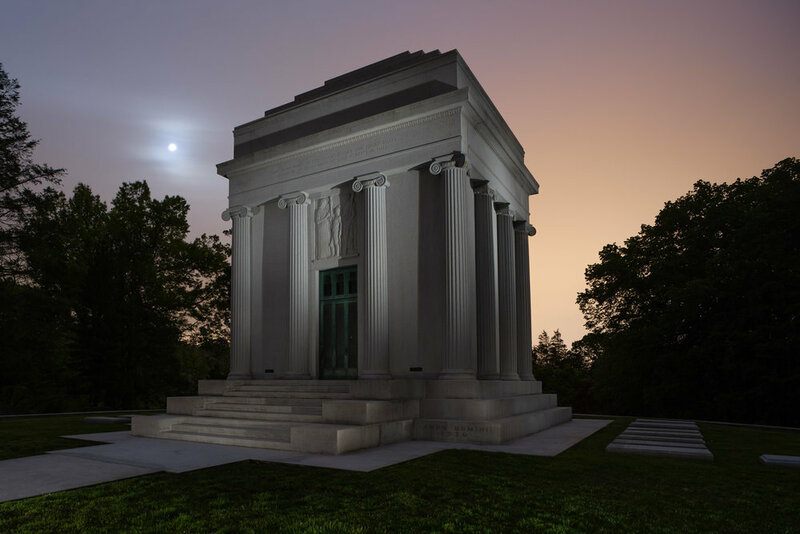 The image below is the Rockefeller family mausoleum, which reflects the wealth and power its residents. The Sleepy Hollow in Tarrytown is the final resting place of Washington Irving, the author of The Legend of Sleepy Hollow and the tale of the previously mentioned truncated equestrian. More on him in a minute. The Rockefeller Crypt at Sleepy Hollow in Tarrytown cost $2 million to construct in 1920. That would be about $22.5 million in today’s dollar. That’s a lot of money to house the family after they are dead and gone, but when your name is Rockefeller, you can afford it. Shot in 2012, with varying cloud cover reflecting mixed streetlighting from Tarrytown and the Tappan Zee Bridge, the combination of which is responsible for the color in the sky. The monument was lit from left, right and low to the ground with a Surefire G2 incandescent flashlight for three of the four minutes during the exposure. Canon 5D Mark II and an adapted Nikon 28mm f/3.5 PC lens. 4 minutes, f/8, ISO 100, with a second, shorter exposure for the moon. Take advantage of multiple mixed lighting sources rather than trying to fight them. Burial Hill in Plymouth, Massachusetts, is a fantastic example of a graveyard that beckons photographers to explore the grounds and very old headstones. Many of the Mayflower Pilgrims and their descendants are buried here, and the varied terrain, the large, ornate stones, and especially the variety of light all make for great photo opportunities. There are no lights in the graveyard proper, but it is in the heart of downtown Plymouth and is surrounded by the lights of the small city of 60,000. Burial Hill in Plymouth, Massachusetts, is one of my favorite cemeteries. This image, made on top of the hill, shows trees lit by the sodium vapor lights of town, but the top of the hill is relatively dark except for some moonlight. The headstones were backlit with a Coast HP7R LED flashlight, with a little “ghosting.” Image made in 2014. Canon 5D Mark II and an adapted Nikon 28mm f/3.5 PC lens. 4 minutes, f/5.6, ISO 100. As is often the case with light painting, sidelighting and backlighting are particularly effective techniques to show the engraved text on gravestones. Mary Meriam and the cheerful winged skull that adorns her gravestone have resided six feet under in Concord since 1693, but despite the many years that have passed, both the ornaments and text on the remarkably well-preserved stone are easy to read, made more so by the strong sidelighting. The key to using this technique effectively is to balance the ratio of added to ambient light in such a way that it draws attention to the stone, but still gives enough exposure to the background to provide context. This image was made in 2010 with an LED flashlight from camera right and slightly above, just out of frame. I held the light even with the edge of the stone to emphasize the deep and well-preserved engraving. I also swept the light across the ground behind the stone to help separate the middleground and background. Canon 5D Mark II and Canon 50mm f/1.4 lens. 2 minutes, f/5.6, ISO 100. Sometimes the best models are the dead ones. I’ve had the good fortune to both photograph and teach workshops at the Sleepy Hollow Cemetery in Tarrytown at the invitation of the cemetery director. It was at the first of these workshops that Matt and I first met while coaxing the elusive Headless Horseman into posing for our students. Aside from the issues of ectoplasm not usually registering on sensors or film, the transient and transparent nature of ectoplasmic beings, and their generally unpleasant temperament, Matt and I have been able to document his regal countenance on multiple occasions. We eventually figured out that the promise of a fresh pumpkin (or a six-pack of Captain Lawrence IPA) was all it took to get him and his noble steed to stand still for a few minutes while we fiddled with lights and made a few exposures. All kidding aside, adding models to your graveyard images is a great way to add some life to the scene. Costuming appropriate to the locale is important, and lighting the figure separately from the background is key. Flash is usually easier to control, and also works well for animate or semi-animate objects that tend to move during long exposures. Combining a long exposure for the overall scene with a burst of light from a strobe can be used to great effect. Backlighting is a great way to separate a dark figure from a dark background, just as silhouetting your model against an open sky may also be. Lighting from below is a way to make anyone look scary. Hugh Francis is the official Headless Horseman of both Tarrytown and Sleepy Hollow, New York. He’s held that unusual position for many years. Outside of the Halloween season, he maintains a farm in upstate New York where he cares for retired New York City police horses, which he recruits to accompany him when he goes out to search for his head. These images were made between 2011 and 2014. Lighting by Matt with a Profoto AcuteB with a Magnum Reflector and grid on a stand with a small softbox directly behind the horse, and I used a Surefire G2 incandescent flashlight for fill from camera right. Canon 5D Mark II and an adapted Olympus Zuiko Shift 35mm f/2.8 lens. 30 seconds, f/5.6, ISO 1600. Lighting by Matt with a Profoto AcuteB bare-bulb directly below the horse and rider, and I used a snooted Surefire G2 incandescent flashlight for the cross edge lighting from camera right. Canon 5D Mark II and an adapted Nikon 20mm f/3.5 lens. 30 seconds, f/5.6, ISO 1600. Lighting by Matt with a Profoto AcuteB on a stand with a small softbox directly behind the horse, and I used a Surefire G2 incandescent flashlight for fill from camera left. Canon 5D Mark II and an adapted Nikon 20mm f/3.5 lens. 4 seconds, f/5.6, ISO 1600. There are a few logistical considerations that should be addressed. Many cemeteries are officially closed at night, and some have fences to keep photographers and teenagers out, and the spooks in. It’s usually the larger historic cemeteries that are restricted. Sleepy Hollow in New York is one such place, while the smaller but equally compelling Sleepy Hollow in Massachusetts is wide open 24/7. Do your homework and make a few calls if you want to go through the gate rather than climb over the fence and take a chance on getting kicked out, arrested or buried alive. It may be possible to gain access with the promise of sharing your images, or by simply showing some examples of what you would like to do. Remember, asking to take pictures in a graveyard at night might seem a little out of the ordinary, so having a way to show that you’re not a weirdo can be helpful. Perhaps the most likely thing to go bump in the night when photographing is graveyards is your head or camera hitting a gravestone after tripping over other stones or the precariously low fences sometimes placed around family burial plots. Take a partner with you, or go alone if you dare—but just for peace of mind, this kind of activity is better with a friend. Opportunities abound for photographing in cemeteries at night, and it’s good fun too. Just be sure to get permission, as they tend to be busier this time of year with ghost hunters, teenagers and disgruntled spirits, and the police make frequent patrols in many places. Take a friend or two to keep you company and to help with the lighting. We’d love to see whatever you come up with, so please post in the Comments section, to our Facebook page, or to Instagram and tag us (@nationalparksatnight). Be careful out there, and Happy Halloween! Hugh trying to figure out where to pour his beer after a hard night’s work, 2016. Coast HP5R flashlight from camera left. Hugh’s dark cape is severely underexposed, but that seems to be the least of his worries. This was a quick grab shot at the end of a long night and we were all having a good laugh at his expense. Hugh is a true gentleman, and a very good sport. Nikon D750, Nikon 24-120mm f/4 lens at 27mm. 8 seconds, f/4.5 at ISO 800.